'Bazaar' is a film whose story revolves around the Indian stock market and is inspired from the Leonardo DiCaprio starrer 'Wolf Of The Wall Street'. In a departure from her girl-nextdoor avatars on screen, Radhika Apte will be seen playing a hot, ambitious financial analyst along with Saif Ali Khan’s businessman part in Nikkhil Advani’s Baazaar. The actress, who is currently shooting for her turn in Mumbai, is cast opposite the late actor Vinod Mehra’s son, Rohan, who is making his acting debut with the film. “It is an unfair slotting when it comes to Radhika. Just because she looks sultry, they cast her as a village girl. I find that quite bizarre. She’s a talented actress who brings a lot to a part. That’s the whole point of casting her as the ball-breaker, ambitious Priya who has no qualms using her sexuality to climb the corporate ladder. For me, it was essential to cast her. We needed someone intelligent enough to understand the nuances of the role,” Advani told Mirror, adding that casting her opposite Mehra works in the film’s favour. Incidentally, Radhika plays a rural girl in R Balki’s Akshay Kumar starrer Padman. “It’s an added benefit that my part is drastically different in both films. I don’t like being typecast. I have finished my part in Padman and I’m focussing on Baazaar now,” the actress signs off. Saif Ali Khan said not all commercial films are fluff and sometimes an actor gets an opportunity to explore oneself as an artiste. The actor said his upcoming film 'Baazaar' is one such project. Directed by Gaurav Chawla, the movie is set in the world of stock markets and trading. The 47-year-old actor plays the antagonist in the film, a street-smart Gujarati businessman. Yesteryear actor Vinod Mehra's son, Rohan is making his debut with the movie. "I think commercial cinema can sometimes give you an opportunity to do good acting. Because it is strong and more dramatic. I really enjoyed that experience of making the commercial cinema more believable and play it like it is more real," Saif told. 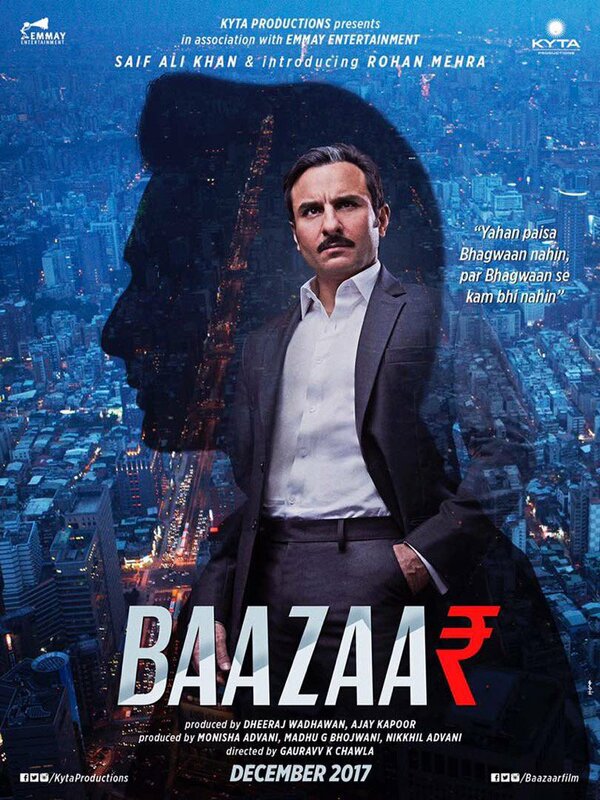 The actor said the intention of the team of 'Baazaar' was to create a human drama against the backdrop of the stock market. My character is like a nasty antagonist. Rohan Mehra is the hero. It is exciting to play strong and powerful roles. I don't distinguish (between roles), it is funny. The idea is even if you play bad, if it is well-written, people don't think they (actors) are being evil or nasty. "I hope the audience likes it. The idea is to play something interesting. And grey is fun. I don't like the idea of playing weak characters. When I was young, I played confused guys, (now I) want to play strong parts." There were reports the film is inspired by the Hollywood movie, 'The Wolf of Wall Street' but the actor rubbished the claim. "'The Wolf of Wall Street' is a celebration and exploration of the extremes of money and capitalism. So you have a guy who is out of his mind on money and drugs, losing the plot in California, within the law, outside the law, nobody knows. We are nothing like 'The Wolf of Wall Street'." Produced by Nikkhil Advani, the film was scheduled to be released in December last year but was postponed. The release date is yet to be announced. "I finished the shooting couple of weeks ago. There are rumours that it is not happening (release), as 'Chef' did not run but it is not like that," Saif said.